It’s clear from a promenade around the Internet that people are confused in the chaos of war. They are stuck in the WYSIWYG mentality despite proof that is faulty logic. The current strategies in play by all sides of the war have been very effective in this information war. Many reading the news and updates in the alt media are confused and taken in by the subterfuge and players put in place to mislead, obstruct and distract. I don’t think there’s anything confusing about this measure, but I doubt most people bothered to look. I’m confused, too. Why isn’t this on every blog, website, video platform, Twitter, Facebook, MeWe, Reddit, and everywhere else? Who does and does not promote this in the alt media will be very telling. To promote freedom, fairness, and economic opportunity by repealing the income tax and other taxes, abolishing the Internal Revenue Service, and enacting a national sales tax to be administered primarily by the States. Be it enacted by the Senate and House of Representatives of the United States of America in Congress assembled, SECTION 1. Short title; table of contents. 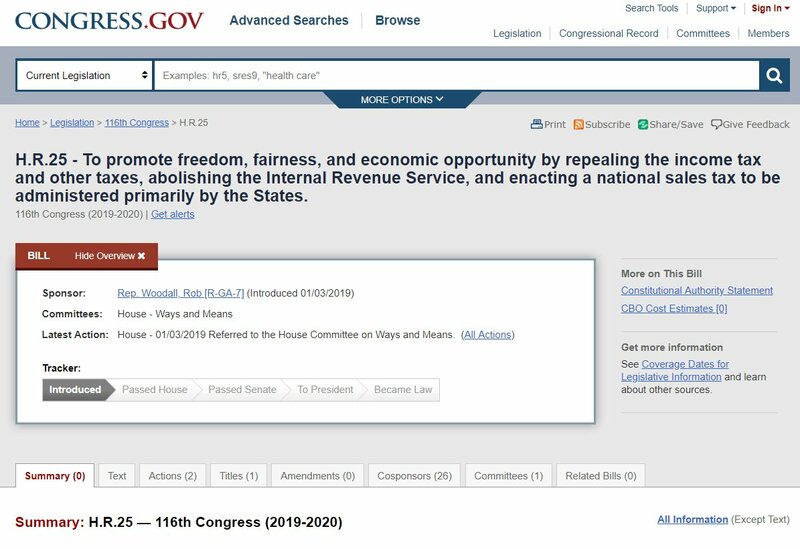 (a) Short Title.—This Act may be cited as the “FairTax Act of 2019”. (b) Table of Contents.—The table of contents for this Act is as follows:Sec. 1. Short title; table of contents. Sec. 101. Income taxes repealed. Sec. 102. Payroll taxes repealed. Sec. 103. Estate and gift taxes repealed. Sec. 301. Phase-out of administration of repealed Federal taxes. Sec. 302. Administration of other Federal taxes. Sec. 401. Elimination of sales tax if Sixteenth Amendment not repealed. (3) have a disproportionately adverse impact on lower income Americans. (4) impose unacceptably high tax planning costs on small businesses and farms. (10) will respect the privacy interests and civil rights of taxpayers. (4) businesses that must collect and remit taxes should receive reasonable compensation for the cost of doing so. (f) Findings Relating to Repeal of Present Federal Tax System.—Congress further finds that the 16th Amendment to the United States Constitution should be repealed.